Are you tired of low sales and small paychecks? Do you wish you had more control over your life? Whether you want to (1) discover the world's best closing techniques, (2) make a lot more money, or (3) learn how to master sales the right way, this audio book will teach you everything you need to know. Stop the pain from lost sales and prevent missed business opportunities from plaguing your career! Learn to develop a great sales strategy. With the right plan of action, you can be the star salesperson month after month. Instead of "selling," you'll find ways to connect with your customers and give them what they want. I have had a 20-year career in the sales industry and have learned many great secrets to sales success from some of the biggest corporations in the world. I'll arm you with the best and most updated knowledge about sales and marketing. Today's consumers are smarter, so I will show you how to connect with them on their level. The tactics in this audio book will help you overcome rejection and get to that yes! With a customer-focused approach, you'll learn how to find that sales sweet spot and begin to grow your customer base. Are you ready to earn insane profits and skyrocket your sales? 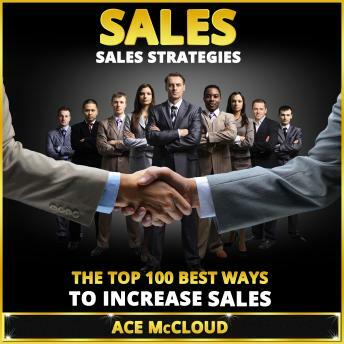 In this audio book I offer you decades-worth of experience and pro sales methods that actually work! If you want to be viewed as a successful professional with lots of happy customers, keep on reading! Say good-bye to low sales forever! Be the star closer and start making some real money: Buy It Now!